After nine days of non stop reined cow horse action in Fort Worth, Texas, the National Reined Cow Horse Association Celebration of Champions wrapped up on Saturday, February 17 with the DT Horses World’s Greatest Horseman Finals in front of a sellout crowd at the Will Rogers Memorial Center. A showdown developed halfway through the very first event, the herd work. Draw five, Kelby Phillips, riding Hickory Holly Time (One Time Pepto x Hickorys Holly Cee x Doc’s Hickory), jumped up and marked the high score, a 220. Then, the very next to go, Phillip Ralls and Call Me Mitch (Metallic Cat x Miss Hickory Hill x Doc’s Hickory), earned a 220.5. The third event, the steer stopping, is notorious for shaking things up but the two leaders continued on a roll. Kelby gained an advantage when he scored 224.5 – but Phillip remained a huge threat with his steer stopping score of 221. Going into the fence work, Kelby and Hickory Holly Time had a four-point advantage. They were second in the draw, and earned a 223.5 from the judges. However, Phillip and Call Me Mitch were last to go down the fence and still had a shot. While this team had the high fence work score of the World’s Greatest Finals – a 225 – it was not quite enough to take over the lead. 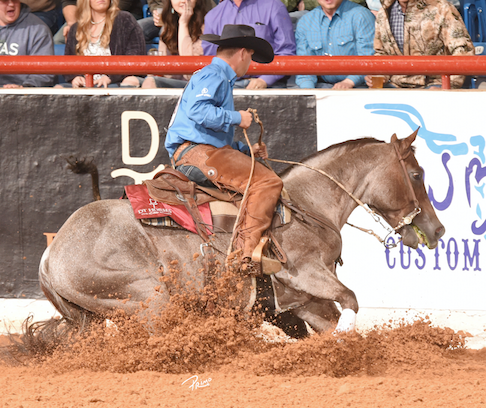 Phillip and Call Me Mitch finish as Reserve – and Kelby Phillips celebrated his first World’s Greatest Horseman Championship.